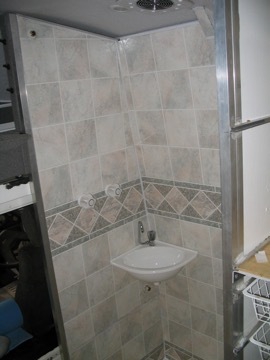 One of the best features of our Oka motorhome is the hot water system and a full size shower. 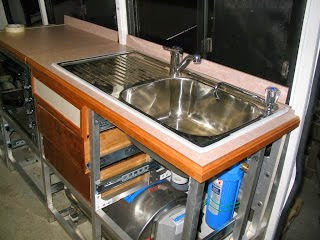 The hot water is supplied from a 40 litre hot water tank with a built-in heat exchanger, heated direct from the engine. 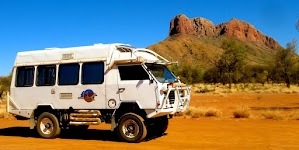 It provides us with ample continuous hot water, and in the dry, dusty outback, there's nothing like a quick hot shower every morning, or evening, even in the remotest desert locations. The shower walls are made of Aquatile sheets (no longer available in Oz but try Bunnings for similar products) glued to an aluminium frame. The shower alcove also has a light, extractor fan, small hand basin and sliding shower curtain. 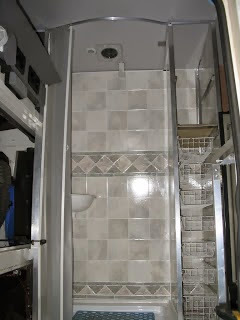 The slide-in wire baskets in the photo are part of the kitchen storage system, before the doors were fitted, attached to the side wall of the shower. While there are gas hot water systems available, there doesn't seem much point in using scarce gas supplies to heat domestic hot water when there is a big engine, creating a lot of heat, just in front. There are two types of engine water heater using a heat exchanger. The "Glind" instantaneous type which taps into the engine heater supply while the engine is running and is intended for use outside the vehicle, or a built in hot water tank containing a permanent source of hot water. We wanted the latter type. I did a lot of research on the various types and makes of heat exchanger hot water tanks and found an excellent review article from a Norwegian boating magazine. The article is at this site and it's translated from the original Norwegian, but the meanings, test methods and results are quite clear. The reviewer bought 9 different makes and tested all their attributes (capacities, heating rate, flow rates, thermal insulation etc) before chopping them all in half to check out their internal construction methods and materials used. While they are all pretty effective, the winner was the Isotemp Basic model made by Indel Marine in Italy (see this link), and is available in a range of sizes from 20 litre, 40 litre, and larger sizes. They are available in Australia through marine suppliers, we bought ours through a local marine store, which saved on shipping costs. Note the 2009 price has almost doubled since we bought ours in 2004. Maybe Indel's take over by Webasto had something to do with that? Much cheaper in the US if the freight cost is reasonable. Note: in 2013 the lower cost locally available source is surprisingly from New Zealand, see here as an example. This picture show the lonely tank in its planned location. It's held down by 2 fairly thin stainless steel straps which are reasonably effective. However after about 20,000 kms, one of the straps broke where it meets the bolt clamp, due to fatigue, so I installed thicker steel clamp straps and also put an extra strap across the middle of the tank, from the side wall of the Oka to the floor, so it can never break lose. (Note: a full 40 L tank will weigh around 60 kg so it needs to be well secured. I fitted extra steel brackets to chassis rails under the floor so that the fixing bolts can't pull through the flooring, which is 20 mm marine ply). 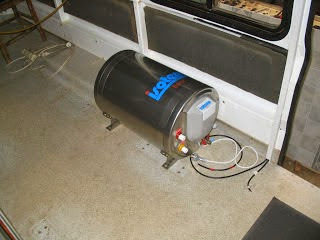 In operation, it heats up 40 litres of water to 60-70º in about 1/2 an hour. If that seems very fast, remember that the Oka engine holds 22 litres of coolant, and that heats up to running temperature in 5-10 minutes. However, a word of warning, the Oka engine water temperature can exceed 80º in normal operation and so, therefore, can the water in the hot water tank. This is a dangerously high temperature with the potential for severe scalding. After burning our fingers a few times, we retrofitted an adjustable thermostatic valve (also from Indel Marine) on the outlet from the tank, which mixes cold water in with the hot to regulate the output temperature. We have ours set to about 50º, more than hot enough for a shower, and just hot enough for dish washing. This picture show the tank being incorporated into the kitchen unit. It will keep the water useably hot for at least 2 days, depending on usage rates, which means running the engine every 2 or 3 days to reheat the water. The tank also has a built-in 240v, 750w electric immersion heater which is useful if you are camped in a caravan park for several days (but why would you be)? Note, it would be possible, if you have at least 200w of solar panels and an inverter, to reheat the water using the immersion heater via a 240v inverter and lamp dimmer. The dimmer, set to around 25%, is required to reduce the load to a level that the panels/inverter could supply without flattening the batteries. That would save running the engine. [BTW we also run our 3 way fridge from a 240v inverter since it is more efficient than using 12v (cable power losses are much less at 240v than at 12v)]. The tank is connected to the engine by normal 20 mm hot water car heater hose which I ran under the floor to the engine compartment and tapped into the heater supply pipes near the engine water pump. Since the water flow to the dashboard heater unit is restricted by its radiator resistance, most of the hot water flows through the hot water tank heater, which is a loop of 20 mm copper pipe inside the tank. This has a lower resistance to water flow than the dashboard heater so it heats up quickly. I fitted a tap on the water heater engine inlet pipe so it can be disabled if necessary. High temperature hose must also be used on the hot water outlet from the water tank or it will quickly perish. Apart from providing hot water, the tank also acts as a 40 litre emergency water supply in the unlikely event that all our other water tanks run dry. A by-product of the hot water tank is that, on starting a cold engine, hot water is now circulated back from the hot water tank through the engine block. This heats it up more quickly than just engine heat alone. With the tap in the supply pipe, this can be prevented if required. Since I now had a source of hot engine water in the rear of the Oka, I extended the pipes further rearwards to a heater unit salvaged from a Ford van, and located under the rear seat. I fitted a Davies-Craig circulation pump in the supply pipe, to extract heat from a hot engine to warm up the rear in very cold locations, like Bathurst in June, or the west coast of Tassie at anytime. Not as effective as a proper diesel heater would be, but a lot cheaper to install and run. If really desperate, by configuring the taps, we could also circulate hot water from the tank to the heater, at the risk of a cold shower in the morning, not something we are keen on. We can, however, fill a hot water bottle to put our feet on. The shower alcove space is not wasted either. During the day, laundry bags, a padded milk crate seat, window screens and other soft paraphernalia, even wine casks and slabs of beer, are stored in the shower base, and above I have fitted a removable drying rack for towels, bathers, damp washing etc., and the sliding shower screen (was a PVC Polydoor from Bunnings but any heavy folding plastic door/curtain would work) keeps it all out of view. A PortaPotti toilet is stored under a seat just in front of the shower and can be located in the shower alcove for use as required.